This is a voluntary car scheme designed to help Brockham residents who require assistance in getting to and from doctors, hospital and other essential appointments. We are operating this service because public transport is limited in this area. For example, the bus service from Brockham does not go to Dorking Hospital, and East Surrey hospital is a difficult journey by bus. Who can use Wheels 4U? If you are unable to drive a car or use the bus easily then Wheels 4U can help! Simply phone 07944 591717. We find a volunteer driver. We phone to tell you which driver will pick you up, take you to your appointment and take you home again. Wheels 4U is a non profit making service that exists solely to help the community. You pay any car park fees and we ask you for a donation towards the cost of your journey. Can I trust the Wheels 4U driver? Yes you can. All our volunteer drivers have been vetted by the Wheels 4U committee and have had some basic training to give you the best possible service. They are all volunteers and want to help you. We will do our best to arrange a driver but we rely on the goodwill of our volunteers and cannot guarantee 100% of the time to meet your requirements. There may be times when this is not possible. 1. Phone 07944 591717 Monday to Friday at least 2 days before you need transport. 2. Have all the details ready. Tell the Duty Officer when you need transport and how long your appointment is likely to be. 3. The Duty Offcier will phone you back later that day to tell you who will be collecting you and at what time. 4 Our driver will give you an envelope to put a donation into, if you wish. Please seal and return the envelope to the driver, who will pass it onto our treasurer. Our drivers are not allowed to handle money. Remember we exist to help you. Feedback is essential so that we can improve our service to you. As regular bus services in Mole Valley absorb funding cuts, this has led to some of the villages that they serve suffering from restricted timetables or even complete cancellation of existing routes. Luckily help is at hand and this information sheet summarises what is currently available in your village through the East Surrey Rural Transport Partnership – a not-for-profit charity that is dedicated to providing transport for rural areas such as Mole Valley. Route 29 Newdigate to Dorking via Parkgate, Shellwood Cross, Leigh, Dawes Green, Strood Green, Brockham and Dorking Station. Route 50 Dorking to Horsham via Coldharbour, Broome Hall, Ockley, Forest Green, Mayes Green, Walliswood, Oakwoodhill, Kennel Cross Roads, Northlands, Broadbridge Heath (and on Saturdays continuing onto Crawley). Route 433 Redhill to Oakwoodhill via Reigate, Woodhatch, Sidlow, Irons Bottom, Dean Oak Lane, Leigh, Dawes Green, Strood Green, Brockham, Dorking, Coldharbour, Broome Hall, Ockley, Forest Green, Mayes Green, and Walliswood. Roue 522 Newdigate to Dorking via Parkgate, Shellwood Cross, Leigh, Dawes Green, Strood Green and Brockham. Route 623 Ashtead to Epsom via Greville Park Road, The Street, The Warren, Epsom General Hospital and the Clock Tower. Fares start at £1.50 for up to 4 miles, children under 5 go free and concessionary bus passes are accepted. The is is a membership only service which calls at Buckland Village Shop, Red Lion Old Road, The Dolphin Betchworth, Betchworth Post Office, The shop at Strood Green and Brockham Green. Follow this link for the latest timetable. For more information, visit the website. We also run a Summer Sunday Rambler Bus 765 between March and October which links National Trust properties in Mole Valley such as Polesden Lacey, Hatchlands Park, Leith Hill Tower, Leith Hill Place and Newlands Corner. Single fares for the Commuter shuttle service are £1.50 per journey and £3 for the Summer Rambler service which also accepts concessionary bus passes. This service is a completely flexible one run under the operating name of Buses4U. This service is open to anyone living in Mole Valley and Sidlow or Salfords from Monday to Friday. All journey requests should be made at least 1 hour before you wish to travel and can be booked up to 7 days in advance. The bus will go anywhere within the Mole Valley District Council area including Salfords and Sidlow. 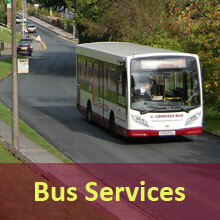 Further information on all these services (including timetables) can be found on www.buses4u.org.uk , www.surreycc.gov.uk , email us on rtp@tandridge.gov.uk or phone us on 01883 732760. All our buses are fully accessible with passenger lifts or ramps. Although we are a not-for-profit charity, all our services rely on your support to make them economically viable so please use them if you can.